Holger Syme presents a radically new explanation for the theatre's importance in Shakespeare's time. He portrays early modern England as a culture of mediation, dominated by transactions in which one person stood in for another, giving voice to absent speakers or bringing past events to life. No art form related more immediately to this culture than the theatre. Arguing against the influential view that the period underwent a crisis of representation, Syme draws upon extensive archival research in the fields of law, demonology, historiography and science to trace a pervasive conviction that testimony and report, delivered by properly authorised figures, provided access to truth. 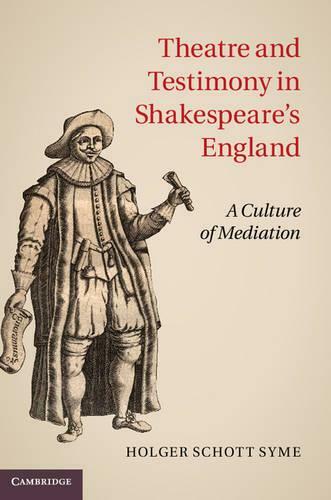 Through detailed close readings of plays by Ben Jonson and William Shakespeare - in particular Volpone, Richard II and The Winter's Tale - and analyses of criminal trial procedures, the book constructs a revisionist account of the nature of representation on the early modern stage.